Sodic soils are common in the south-west agricultural area where they occur mainly as duplex or gradational profiles. 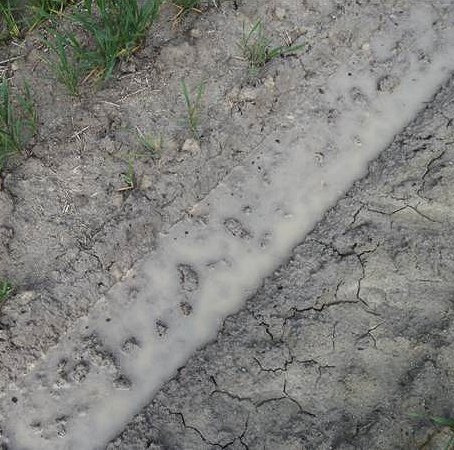 Sodic duplex soils are particularly susceptible to dispersion and waterlogging, because they are commonly on broad, flat landscapes with poor drainage. There are several management options that improve soil structure and potentially improve crop yield on dispersive (sodic) soils. What is a dispersive soil? A dispersive soil is so-called because the soil aggregates (small clods) collapse when the soil gets wet by fresh water, because the individual clay particles disperse into solution. This collapse of structure causes the soil to slump, lose porosity and become denser, thus restricting root growth of annual crops and pastures. What is a sodic soil? A sodic soil is defined as a soil with an exchangeable sodium of greater than 6% of the cation exchange capacity. Non-saline sodic soils are usually dispersive in the presence of fresh water. Saline-sodic clays are less dispersive than non-saline-sodic soils and have higher infiltration rates. Many sodic clays may still produce wheat yields near their rainfall-limited yield potential, where the salt levels in the soil solution are higher than the critical flocculation concentration, but are not toxic to plants. observe visual indicators of moderate or severely dispersive topsoils. The exchangeable sodium percentage (ESP) measures the proportion of cation exchange sites occupied by sodium. Soils are considered sodic when the ESP is greater than 6, and highly sodic when the ESP is greater than 15 (Table 1). Non-sodic <6 No dispersion evident after 24 hours. Aggregates slaked but not dispersed (milky) clay. Slightly sodic 6–10 Dispersion (milky halo) evident after 24 hours. Soil aggregates slightly disperse. Moderately sodic 6–10 Dispersion (milky halo) evident after several hours. Soil aggregates partially disperse. Highly sodic >15 Dispersion (milky halo) evident in less than 30 minutes. Soil aggregates completely disperse. place the soil aggregates into a clear jar of distilled water, taking care not to mix or agitate the soil. Aggregates will often, but not always, slake (crumble) soon after being placed in the water; however, this is not dispersion. The water around the edges of the soil aggregate in a dispersive soil will become cloudy and milky looking (water looks dirty) because of the dispersed clay (Figures 1 and 2). For a highly dispersive soil, dispersion will be obvious after about 10-30 minutes; for a moderately dispersive soil, it may take 2 hours for dispersion to be obvious (Figures 1 and 2). cracks can appear in some dispersive soils as the soil shrinks on drying. Dispersive soils are susceptible to water erosion. Dispersive soils used for dam walls are very susceptible to tunnel erosion, and these dam walls often fail if there is a sudden inflow of fresh water. While some dispersive soils can be acidic, the majority of dispersive soils in the Western Australian grainbelt are strongly alkaline with soil pHCa greater than 8.5. These strongly alkaline dispersive soils can also contain high concentrations of salt and boron. High boron levels are toxic to some crops and pastures and can reduce yields. Salt tends to reduce the dispersive behaviour of soil, and dispersion may only be seen in saline soils when the soil is disturbed or large amounts of fresh water dilute the salt. Dispersion may be completely prevented in highly saline soils despite a high percentage of exchangeable sodium.